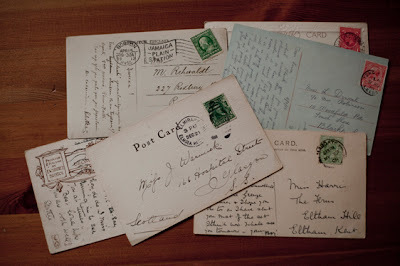 Growing up I loved flicking through my Mum's collection of postcards, she had quite a selection but my favourites were usually the oldest as the handwritten salutations on the back piqued my interest. 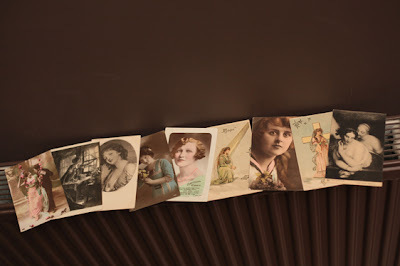 I came across a stack of around 50 wartime postcards at a boot sale a couple of years ago and the seller kindly said she'd save them for me while I dashed to the cash machine down the street since I'd run out of funds early on with enthusiastic purchasing! Unfortunately when I came back the seller's husband had sold them while she queued for cups of tea but I found this little selection on eBay a couple of weeks later. The handwriting is just exquisite on each of the used cards - the art of correspondance is something we've lost with instantaneous methods of communication. Most of us are far more likely to communicate via email, text or phone than through picking up a pen so it is nice to have these little windows into the past! I always love when I come upon stashes of these, I try and grab as many as I can, price allowing. 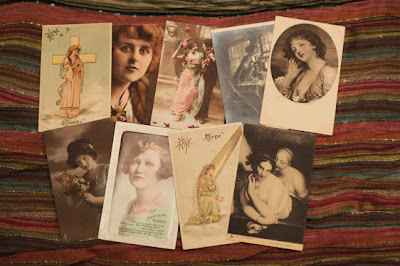 What a wonderful collection and I too love old postcards. There's nothing like getting a lovely hand written note! Thank you for visiting...have a fabulous week! Awww.........Its quite wonderful blog and I really appreciate your work.your collection of postcards r looking so attractive thats why I follow ur blog and thanks for visiting my blog. Those are cool postcards =) My sister makes me send some every time I travel. oh gosh, postcards are such wonderful things to recieve.